So there they were, Pat Summitt and Glen Campbell, sitting there and announcing to the world, I have Alzheimer's. 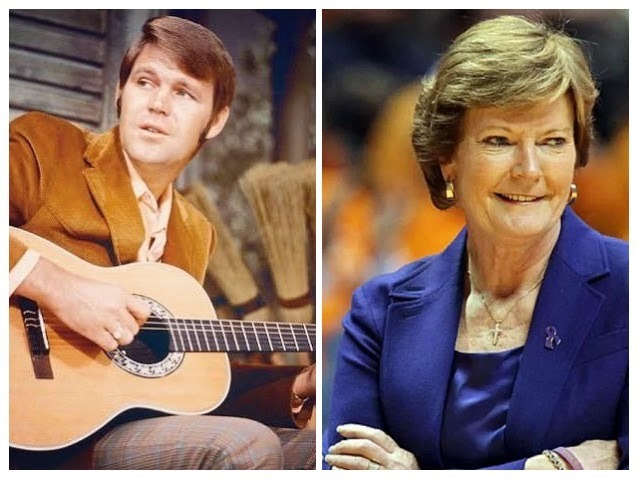 I think it is safe to say that a large fraction of the American public were greatly saddened by the news that both Pat Summitt and Glen Campbell have been diagnosed with probable Alzheimer's disease. I can tell you this. On the day when the news was released about Pat Summitt we had a record number of people coming to the Alzheimer's Reading Room via search looking for information on dementia. This continued for a few days. What is the difference between Alzheimer's and dementia continues to be the number one search article on this website. With this in mind, you might want to share that article via email or social media with others. Current statistics indicate that more than half of the American population has been touched by Alzheimer's disease. This number rises each year, and it continues to rise fast. Everyone in the audience is either going to get Alzheimer's, or know someone who has it. The awareness of Alzheimer's certainly grew with the announcements that Pat Summitt and Glen Campbell are now living with Alzheimer's. I have been thinking about this for the last week. As you know, I believe in looking beyond the obvious, and in these cases it is obvious to me that there is a silver lining. Let me start by saying this, I admire Pat Summitt and Glen Campbell for having the courage to come forward. Most of us in the Alzheimer's community know there is a stigma attached to Alzheimer's. Let's face it, in many cases family and friends run for cover when they hear the word -- Alzheimer's. Alzheimer's is a disease of denial. Patients deny that they have Alzheimer's. Family members and friends refuse to believe even after diagnosis that a person is suffering from dementia. Learn More - Do Persons Living with Dementia Feel Abandoned? The only way this can change is through education and awareness. There are all kinds of stigmas attached to Alzheimer's. How many times have I been told, I'm embarrassed to take them out because of the way they act. I'm embarrassed to take them out because they eat with their hands. This is not the person I knew. My heart hurts and I feel sad when I have to type those words. Keep on living their lives. Those actions made my heart soar. There can be no doubt that Pat and Glenn changed the perception that many have of a person living with Alzheimer's disease. They don't bite, they won't stab you, and its not contagious. There can be no doubt that Pat and Glenn raised awareness about the disease. Millions of Americans turned immediately to the Internet to learn more about dementia. When Pat and Glenn spoke, there were no scare tactics. No vilification rhetoric. No talk about how "no one survives Alzheimer's". Quite the opposite. It seemed to me to be more about a celebration of life. Life goes on. Just say "no" to Alzheimer's. So yes, it seems to me there is a silver lining. Pat and Glenn did something that is hard to do and in some ways seemed impossible to me -- they started to erase the stigma that surrounds Alzheimer's disease. No scare tactics, no nasty words with negative connotations, no fear mongering. Continue to live your Life.